After delivering the nuke on the previous concepts, I took a break from doing art as it were but then the stuff I had wasn't up to scratch so using the modified templates from @edjb93 to which he got from the original templates of @LEWJ... I present my own personal takes on the NFL, unknown at the moment if I'm going with the expansion teams I did last time. Presenting the Home kit with two alternate pants, the Road kit with two alternate pants with the Alternative kit, the Throwback kit and borrowing the NBA's City Jerseys to create a special one game only Big City Set. First of all, the easiest team to start off with. I remember seeing some of your other concepts, and I like that you’re giving it a second go, however some of the same flaws are still present this time. Now I want to start with a disclaimer: I’m not familiar with making concepts on a computer, so I can’t tell you what to do within your program, but I’ll give the best feedback I can from a standard artistic standpoint. Before even looking into the designs themselves, I have to say something about the colors. You’ve got three different color schemes going on here; navy-yellow, navy-gold, and red-gold-neon green. That has to get narrowed down. I don’t care which one you pick, but it needs to be more consistent across the board. Now for the designs themselves. Like I said, I can’t tell you what to do in your program, but I’ll give you what I can based on an artistic standpoint. There’s certain parts of the template that just seem randomly filled in like how one pair of yellow pants has the top part filled in white (side note: why two pairs of yellow pants?) and some jerseys have filled in nameplates. The design elements that aren’t just inside the lines of the template feel very sloppy, like the helmet horns and sleeve designs. I know what you’re trying to do, but it looks very sloppy. It’s clear that you did that part free handed with the mouse. There’s got to be a better way to clean that up. I don’t know what specifically you need to do in whatever program you use, but the best way to clean up something that looks a little sloppy is to just slow down and take your time. 1, I shall that disclaimer with my own disclaimer... I have done this with art programs, i'm not good with photoshop.... Paint is my skill level, one shouldn't judge one's skill because of the program I use. 2, Oh that's the issue? No worries, I thought that by NCAA'ing the uniforms so to avoid clashing with other uniforms on certain match days but what i'll do is do the same BUT I'll post the best 3 in a final design... in a moment or so. 3, Doing this by hand IS hard and I have no tools to clean it up, so you are getting what you are seeing... my time was taken if you get the drift. Thank you for your input, it's what I wanted last time but never got enough. Now then.... I posted 9 uniforms, the 3 homes, 3 roads, Alternate, Throwback and Big City and then choosing the best 3 of each Home/Road/Other... we get the final 3. That should do it, now to do the other LA team.... the Chargers and I make apologises for my hand crafted work. I won't delay this much longer but now I present the first AFC team of this concept batch, the other LA team... the Chargers. And I figured the primary blue will be powder but I also want to use their color rush blue and their navy blue and create uniforms based of those plus what their big city uniform is like.. which is to represent what Los Angeles is also known for but ignoring Hollywood altogether.... PALM TREES and 50's style suits. When time passes, I'll choose the best three before moving onto the next one. Why no chargers yellow alt? Officially I don't think an all yellow alt kit would work and Spanos wouldn't say yes to it.. besides one is a throwback alt whilst the other focuses three different types of blues that have been in Chargers history... but I have done a yellow alt just as you asked, what do you think? This is what I’m saying! Amazing work my friend! 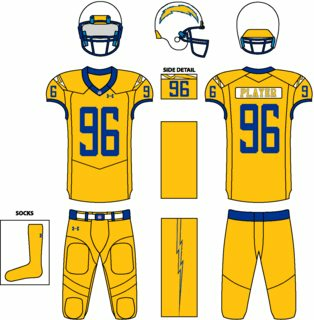 Time to simplfy the Chargers set... and here's what I chose for Home/Road/Alternate. Not sure when's the next update... I have some ideas on who's next. I looked at the Chargers concept again and made a few clean ups based on suggestions here... numbers are straights, unused areas were removed and pants colours were revertred back, I tried to be fancy so my fault there. Did the same to the Rams... cleaned up a few areas, removed unused bits etc. Time to choose the three that best fits the Panthers.... and here we go. Next up will be in the AFC South... not sure who to pick yet. Quickly moving onto the next team.... moving onto the AFC South, lets go to the other team that came in alongside the Panthers. The throwback is essentially the original kit with the original colours... so technically it's 'aqua' and metallic gold. The big city outfit as I call it... is a reference to the Navy's elite flying unit, the Blue Angels... then again Jacksonville isn't known for much. Time to unveil what 3 kits make up the Jaguars for this concept... the double teal and black nearly won it as well as the new aqua and metallic gold... but I haven't gotten a throwback issued here yet so I chose that for the alternate. They needed to add gold which was true... however that half gold, half black helmet was a big NO-NO. Also made the changes with the nameplate.